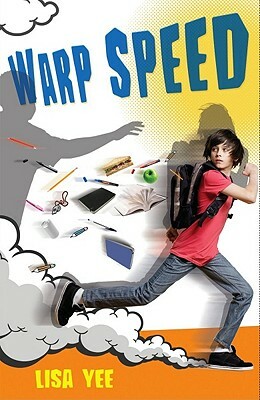 This week's Middle Grade marvel is Warp Speed by Lisa Yee (Arthur A. Levine/Scholastic, March 1, 2011, for ages 10-13). Marley Sandelski can run fast. He has to run to get away from the Gorn, the bullies who wait for him after school each day. But he can't run away from Digger, a different kind of bully who forces Marley to do his homework for him. Digger threatens to have his rich dad buy out Marley's parents' movie theater. And everyone knows Digger's dad has a lot of influence. So Marley does all of Digger's homework and runs faster and faster from the Gorn. When the track coach begs Marley to join the team, Marley doesn't know what to do. If he joins track he has to give up AV club -- and that's where his only friends are. Marley's obsessed with Star Trek and his friend Ramen is obsessed with Star Wars. The new kid, Max, is obsessed with Batman. Together, they have a friendly rivalry about the superiority of each show or movie (and this is where the book's humor shines). But one day, everything changes. The Gorn catch Marley and beat him up. He doesn't tell anyone, not even his Mom, who's blind. His Dad guesses what happened and tells Marley he was bullied as a kid too. Then an anonymous caller tells the school principal about the beating and Principal Haycorn starts a campaign with bracelets and slogans ("Be a buddy, not a bully"). Marley knows it won't stop the bullies. But he doesn't know who the anonymous caller was. Would his Dad have done that? Would Ramen or Max? It could even have been Emily Ebers, Marley's Home Sciences partner. Or Stanford Wong, Marley's former friend, who's been ignoring him for years. Can Marley find his own way to stand up to the bullying? And can he convince Emily Ebers to be more than just friends? If you've read Millicent Min, Girl Genius (one of the funniest books I've ever read) or So Totally Emily Ebers or Stanford Wong Flunks Big Time, you'll recognize Rancho Rosetta Middle School, the setting for Warp Speed. And all of those characters play minor roles in this book. Lisa Yee's genius is in presenting a tough issue with grace and a lot of humor. You really feel for Marley and hope he'll do the right thing. A fast-paced read with believable characters and a hero you'll cheer for. Marvelous Middle Grade Monday was created by Shannon Whitney Messenger. Check out these other great MMGM posts from Shannon O'Donnell, Ben Langhinrichs, Myrna Foster, and Brooke Favero. This sounds like a great book, Joanne. Thanks for the recommendation! Thanks for the link. I'm linking back to you from now on. Sounds great, and a perfect book for starting conversations about bullying. Thanks for sharing this. I'm a huge fan of Lisa Yee. I'll need to go get this one. Great review. My TBR pile is growing at a ridiculous rate. Thanks for linking, Myrna! Nice to see you here. Thanks, Ben. Yes, bullying is a hot topic right now, and this book is accessible and funny, so kids would actually want to read it. Hi Brooke! YAY for fans of Lisa Yee. And I know what you mean about the TBR pile. I'll never have time to read all the great books I hear about from everyone's blogs. This looks great. My only question is-- AV club? Is this set in the 1980s? Still really want to read this! Hi Ms. Y! Good point. No, it's supposed to be modern day. They mention the 2009 Star Trek movie with Chris Pine and Zachary Quinto. On the first day of school, the moderator says, "Even though we're officially Technical Sciences, among us we'll still call ourselves 'the AV Club.'" I'm quoting the ARC here, so the final book may be different. I've sold out of it at work, so can't check the wording right now. But the ARC certainly mentions AV Club many times. I think it's supposed to be a geek thing!